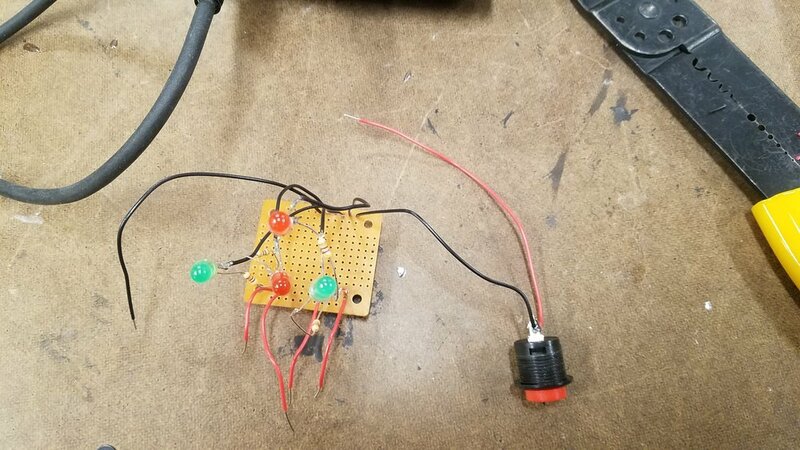 For the most recent fabrication assignment we were required to build an enclosure for an electronics project that had utilized multiple components. After spending some time thinking about what I wanted to make I decided that I wanted to make something fun and pointless. What I came up with was the “Extremely Inaccurate and Unhelpful NYC Weather Predictor.” Basically it’s just a box that has one push button and when you push the button a “random” combination of LEDs lights up. I went to the container store to get the box for the project. Using calipers I measured the inside edges of the box to see that the dimensions were 5.67’’ x 5.72’’. After that I created the illustrator file with an initial design to try out on the box. After that I laser cut a piece of cardboard to test the size and design of the top. After some tweaks I laser cut a piece of black acrylic. An issue that arose with the first cover was that the hole for the button was not big enough. Although the button fit in the cardboard prototype with a hole the same size I should have accounted for the acrylic not having any give. Another problem I noticed was that I misspelled the word Inaccurate in each piece of acrylic. I decided that I didn’t want to buy any more of it though so I decided to leave it. After the initial fabrication I built the light switching circuit and attached it all to the top acrylic panel. The final fabrication part was drilling a hole in the back of the box for the arduino’s power cord to go through. Drilling the wood I used small drill bits and then progressively worked my way up to larger bits to try and not damage the wood or splinter it too much. It didn’t work amazingly but the outer portion of the box looked alright. Overall, I am happy with final product, minus the typo. I should have figured out a better way to drill the hole in the back and probably should have mounted the arduino better inside but for this prototype I am happy with the enclosure.